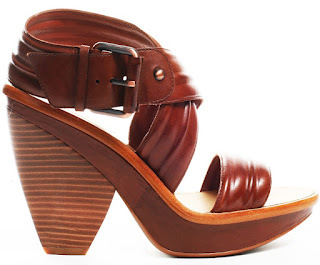 Today I wanted to feature a more subtle shoe style but one that still had a bit of an edge; in comes the Max Studio Umeko Heel with its thick strapped ridged chestnut leather upper, wraparound ankle strap, oversized burnished copper buckle, and a 4 1/2" chunky stacked block heel with 1 1/4" platform. This is a style that's perfect as an every day shoe because it would compliment everything. The color is rich, the style is universally pleasing and the heel, though high, looks welcoming, making this a wardrobe staple.